NEW YORK, NY--(Marketwired - Apr 14, 2015) - Brookfield Property Partners L.P. (NYSE: BPY) (TSX: BPY.UN) today announced it will begin construction on One Manhattan West, a 2.1 million-square-foot office tower located at the southwest corner of Ninth Avenue and 33rd Street, having secured a 20-year lease with Skadden, Arps, Slate, Meagher & Flom LLP ("Skadden") as the anchor tenant. Skadden will occupy 550,000 square feet on floors 28 to 43 in the building, the first of two planned commercial buildings to be built at Brookfield's five-acre development, Manhattan West. "We are thrilled to welcome Skadden to Manhattan West," said Dennis Friedrich, CEO of Brookfield Property Partners' Office division. "This is an exciting time, to be building an entirely new neighborhood anchored by class A office towers that will redefine the west midtown skyline. When this building opens in 2019 it will be home to Skadden and other exceptional companies from New York and around the world, and Manhattan West will have established itself as a dynamic, vibrant mixed-use community." "We look forward to moving to a state-of-the-art building at Manhattan West, and to being part of New York City's most dynamic new neighborhood," said Skadden's Executive Partner, Eric J. Friedman. Wells Fargo Bank, N.A., Deutsche Bank AG New York Branch, The Bank of New York Mellon, and The Toronto-Dominion Bank are co-leading $1.25 billion in construction financing for the tower. Brookfield is investing $850 million in the project, bringing the total cost to $2.1 billion. When completed, the $4.5 billion Manhattan West development will include two new class A office towers, retail, rooftop gardens, restaurants and cafes and a luxury residential building. A two-acre public park will transect the site. Skadden was represented in lease negotiations by Peter Riguardi, Kenneth Siegel, and Matthew Astrachan of JLL. Brookfield was led in-house by Jerry Larkin, Duncan McCuaig, and David McBride, and represented by Bruce Mosler, Josh Kuriloff, Mikael Nahmias, and Ethan Silverstein of Cushman & Wakefield. Construction began in January on Brookfield's 62-story, 844-unit luxury residential tower in Manhattan West at 435 West 31st Street between Ninth and Dyer Avenues. Brookfield's Manhattan West development is a dramatic addition to the Midtown Manhattan skyline, with seven million square feet of office, residential and retail in the center of the most exciting growth area of Manhattan. Brookfield's development sits at the gateway to Manhattan's new West Side just one block west of Penn Station and at the entrance of the Hudson Yards district. 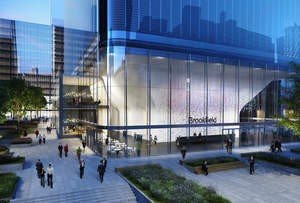 Brookfield Property Partners is one of the world's largest commercial real estate companies. Our goal is to be the leading global owner, operator and investor in best-in-class commercial property assets. Our diversified portfolio includes interests in over 100 premier office properties and over 150 best-in-class retail malls around the globe. We also hold interests in multifamily, industrial, hotel and triple net lease assets through Brookfield-managed private funds. For more information, please visit www.brookfieldpropertypartners.com. This news release contains "forward-looking information" within the meaning of Canadian provincial securities laws and applicable regulations and "forward-looking statements" within the meaning of "safe harbor" provisions of the United States Private Securities Litigation Reform Act of 1995. Forward-looking statements include statements that are predictive in nature, depend upon or refer to future events or conditions, include statements regarding our operations, business, financial condition, expected financial results, performance, prospects, opportunities, priorities, targets, goals, ongoing objectives, strategies and outlook, as well as the outlook for North American and international economies for the current fiscal year and subsequent periods, and include words such as "expects," "anticipates," "plans," "believes," "estimates," "seeks," "intends," "targets," "projects," "forecasts," "likely,", or negative versions thereof and other similar expressions, or future or conditional verbs such as "may," "will," "should," "would" and "could." Factors that could cause actual results to differ materially from those contemplated or implied by forward-looking statements include, but are not limited to: risks incidental to the ownership and operation of real estate properties including local real estate conditions; the impact or unanticipated impact of general economic, political and market factors in the countries in which we do business; the ability to enter into new leases or renew leases on favorable terms; business competition; dependence on tenants' financial condition; the use of debt to finance our business; the behavior of financial markets, including fluctuations in interest and foreign exchanges rates; uncertainties of real estate development or redevelopment; global equity and capital markets and the availability of equity and debt financing and refinancing within these markets; risks relating to our insurance coverage; the possible impact of international conflicts and other developments including terrorist acts; potential environmental liabilities; changes in tax laws and other tax related risks; dependence on management personnel; illiquidity of investments; the ability to complete and effectively integrate acquisitions into existing operations and the ability to attain expected benefits therefrom; operational and reputational risks; catastrophic events, such as earthquakes and hurricanes; and other risks and factors detailed from time to time in our documents filed with the securities regulators in Canada and the United States. One Manhattan West offers stunning views from a vantage point one block from Penn Station. The lobby of One Manhattan West is next to the Central Plaza, a 2-acre tree-lined park that will host major events by Arts Brookfield. 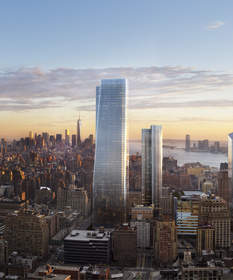 One Manhattan West (at right, pictured here alongside Two Manhattan West) is designed to be a LEED Gold building and offer best-in-class amenities for top-tier tenants.